client IP : used to detect fake Googlebot hits. Sometimes, as some of our Users use server cache, the client IP corresponds to the server cache's one. It means that we do not find any Bots hits because our Googlebot IP address' verification is running. So, in order to retrieve data about Bots hits, we need to deactivate the Google IP address verification. It may occur in finding some bias in your logs data as some of them may come from fake Googlebot. www.oncrawl.com:80 66.249.73.145 - - [07/Feb/2018:17:06:04 +0000] "GET /blog/ HTTP/1.1" 200 14486 "-" "Mozilla/5.0 (compatible; Googlebot/2.1; +http://www.google.com/bot.html)" "-"
www.oncrawl.com:80 37.14.184.94 - - [07/Feb/2018:17:06:04 +0000] "GET /blog/ HTTP/1.1" 200 37073 "https://www.google.es/" "Mozilla/5.0 (Linux; Android 7.0; SM-G920F Build/NRD90M) AppleWebKit/537.36 (KHTML, like Gecko) Chrome/64.0.3282.137 Mobile Safari/537.36" "-"
If you host multiple subdomains (for example, https://www.oncrawl.com and https://fr.oncrawl.com) on the same server, make sure that the two subdomains are clearly identified in your logs. One way to do this is to verify that the full URL is used instead of just the query path. This will take you to the space where you can add any additional data sources. You will already be looking at the "ADD LOGS" tab. 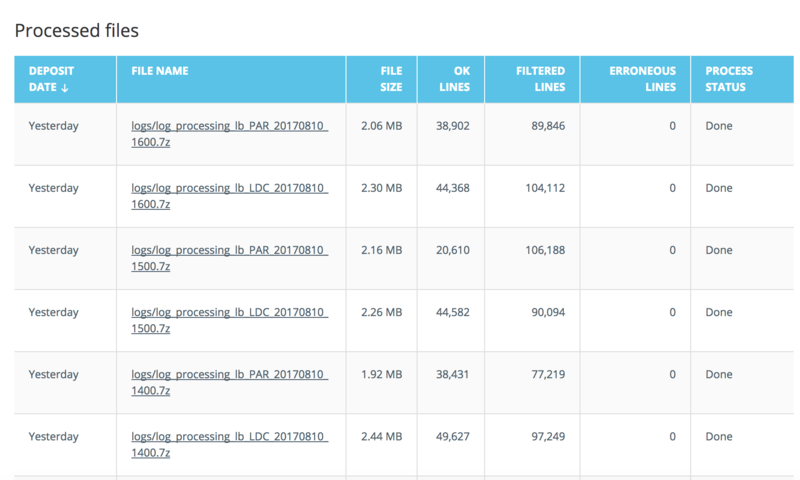 OnCrawl should automatically process your log files accordingly to what you've chosen. You have access to your log files and now they are ready to be uploaded into OnCrawl. First, make sure that your network firewall is open for FTP connections. 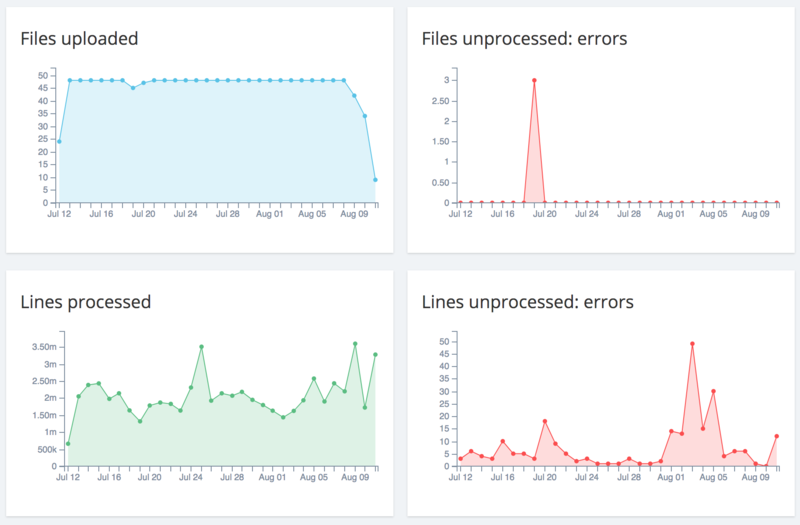 OnCrawl's Log Manager Tool allows you monitoring the processing of your log files. You can find the "LOG MANAGER TOOL" button where the "ADD LOGS" button used to be. What sort of information can be monitored? OnCrawl activity displays information regarding OnCrawl parsing jobs, whereas files Queued for parsing, Currently being parsed, Queued for export, and Currently being exported. 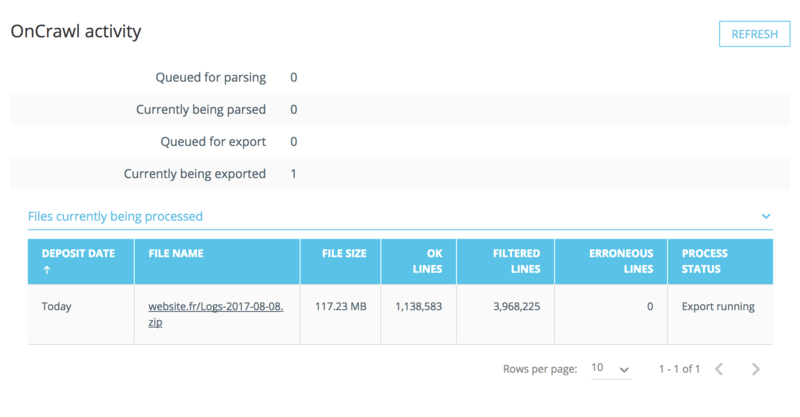 At this first stage, OnCrawl evaluates the data contained in your log files. Second stage, the Log Manager Tool displays graphs regarding the uploading process and the parsing process. Finally, the tool shows an explorable data table with information including File Name, Deposit Date, File Size, OK Lines, Erroneous Lines, and Filtered lines. File Names are clickable and explorable. On the contrary, having lots of log lines in the columns "Erroneous Lines" and "Warnings" should indicate a parsing error. In that case, contact us using the OnCrawl chat box, we are happy to help. You are now all set. Click on the "SHOW LOGS MONITORING" and being your logs analysis.